Ashes to Ashes covers The Songs of David Bowie, 1976-2016 — every song Bowie wrote or recorded in that time period in chronological order. Each song’s recording details (location, personnel, etc.) are given, followed by information about the writing and recording culled from interviews with Bowie and others involved. Most also include lyrical and musical analysis, covering documented and speculated inspirations, influences, and connections. Author Chris O’Leary has done extensive research, and each song gets at least a page or so of attention, with some running into double digits. If Bowie ever mentioned the song in an interview, quotes are given, and some of the more interesting cases involve multiple quotes from years (or decades) apart. Where relevant, there is connecting material describing, for example, Bowie’s reasons for relocating from Los Angeles to Berlin. When a new collaborator appears, their background is filled in, at least in basic terms. The book starts out where O’Leary’s previous book, Rebel Rebel - All the Songs of Bowie ‘64 - ‘76, left off, with Bowie in Berlin working with Iggy Pop on The Idiot, moving into Bowie’s own Berlin albums, Low, Heroes, and The Lodger, along with Pop’s Lust for Life. A continual theme is that often Bowie didn’t seem really sure what he wanted to do next, or if he even wanted to continue making music. One outgrowth of this was his approach to writing lyrics, which were often the result of semi-random processes where he took phrases that intrigued him and metaphorically threw them into a hat. Many of these phrases came from the wide range of books he read, but current events also figured in, and his own past lyrics as well. Bowie’s process almost always left the lyrics to late in the process, so the musicians who played on the backing tracks often didn’t even know the real titles of the songs they were working on. It’s also interesting to note that Bowie worked very quickly as a singer, rarely doing more than two takes of a song to get the final version. When he sang guest vocals with other artists, they were amazed at his ability to get a new song down in such a short time. Each song is also subjected to critical evaluation, judged both within the Bowie canon and to outside music. Far from being a wide-eyed Bowie fanboy, O’Leary offers honest opinions, and when he thinks a song is substandard, he says so, giving his reasons like a good critic should. Many times these opinions align with the artist’s own evaluation of the work, as in Bowie’s stated low opinion of Never Let Me Down. I don’t always agree with O’Leary — in particular I’m much more fond of Earthling than he is — but his judgments are well-considered and generally well-explained. Certainly in the history of rock and popular music, few artists have produced a body of work that can withstand this kind of treatment, especially when this book is considered as only half the story. And even though Ashes to Ashes is not a biography, it presents a rich and detailed picture of David Jones. In particular, his penchant for performing his life in addition to living it. Whether it was in the studio, on stage, or in meetings with the press, Bowie presented a narrative that was sometimes raw and personal, sometimes artificial and highly fictionalized. From year to year, the story would change, and little he said could be taken at face value. He was a mythical figure largely of his own making; he showed the world what he wanted it to see. His personal life is touched on only tangentially in this book, noted as it relates to the songs he wrote, whether it’s divorce, marriage, fatherhood, or health. It is possible, as O’Leary mentions late in the book, that the era is past when an artist like David Bowie can achieve widespread fame while maintaining such a contradictory persona and obscure artistry. In today’s world of instant media access to almost everything, the kind of self-mythologizing that Bowie did may no longer be possible — when you’ve been on Facebook since childhood, secrets are harder to come by. If that’s the case, having Bowie’s work documented and analyzed in this way is even more important as a snapshot of a lost world. Bowie’s passing left the world a slightly less colorful place, and it matters not one whit that most of what outsiders think about his life has little relation to the man born as David Jones. 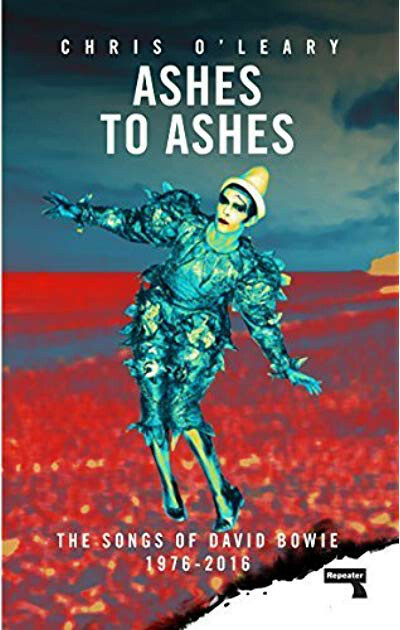 Reading Ashes to Ashes straight through as I did, largely while commuting on the bus, was sometimes frustrating. Reading about a song made me want to listen to it, and I didn’t have the entire Bowie catalog at my fingertips. Maybe the best use for the book is as a reference, to be consulted at leisure while listening to the music. Some of the narrative thread would be lost, but the immediacy and relevance of the descriptions would be much enhanced. It wasn’t until I got to the last couple of chapters, dealing with The Next Day and Blackstar, that I was able to put together playlists of the songs in the order they’re covered (remember, the book takes things in the order recorded, not how they appeared on the albums) and read while I listened. This was especially helpful when dealing with the more technical musical descriptions, such as key changes and variations in melodies. I don’t know how useful this book would be to someone who’s not already a Bowie fan, but soaking in this wealth of information, complete with the highs and lows, serves to deepen my appreciation of this singular artist. Mr. Jones, you were one of a kind, and never again will this world see your like.